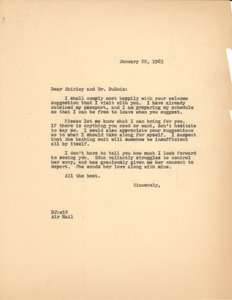 New York (N.Y.) - In this brief letter Bernard writes to Shirley and W.E.B. about his excitement to finally be able to visit them. He asks if there is anything they need and any recommandations as to what he should bring. 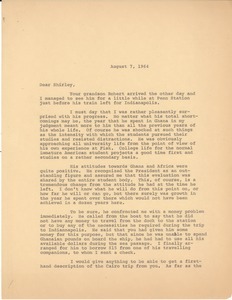 New York (N.Y.) - Bernard writes to Shirley that Robert has arrived in New York and he was able to spend sometime with him while he waited in Penn Station. Bernard talks about how he felt that Robert's experience in Ghana has had a positive effect on him. Bernard also talks about the "emergence of Goldwater". 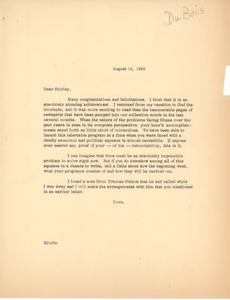 New York (N.Y.) - Bernard writes to Shirley congratulating her on finally launching the television program. 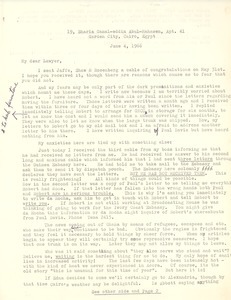 He also writes that while he was away Truman Nelson contacted him and that he will make the arrangements with him that she mentioned. 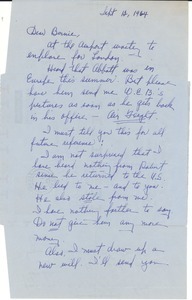 Accra (Ghana) - Shirley writes to Bernard while waiting to board her flight to London. She ask that he get word to Abbott to have W.E.B. 's picture sent to her as soon as he gets back to his office. Shirley also writes that she is not surprised that Robert has no written and that Bernard should not give him anymore money. 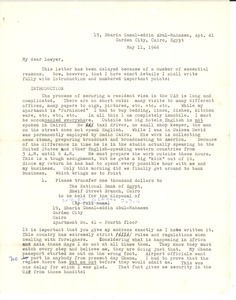 Cairo (Egypt) - Bernard writes to Shirley thanking her for her "recent cable and good wishes." Bernard also wants to make sure that Shirley got the information she was asking for about the transfer of funds to her account in Cairo. 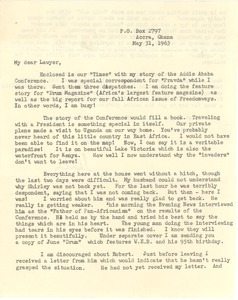 Accra (Ghana) - Shirley writes to Bernard that she has been busy working as a " special correspondent for Pravda" and has just attended the Addis Ababa Conference. Her story is begin featured in Drum Magazine. W.E.B. is getting weaker. Accra (Ghana) - Shirley writes to Bernard worried because she has not received any letter from him. She hopes that he and his family are in good health. 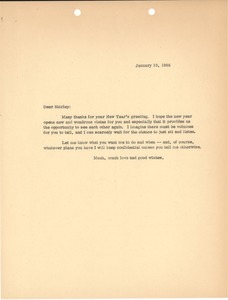 New York (N.Y.) - Bernard writes to Shirley thanking her for the New Year's greeting's. Bernard hopes to be able to see Shirley again soon. 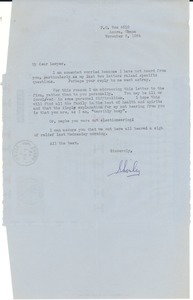 New York (N.Y.) - Bernard writes to Shirley about the customs declaration. 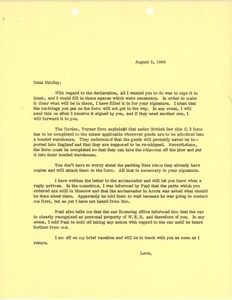 Bernard has written to the ambassador about Shirley's request.